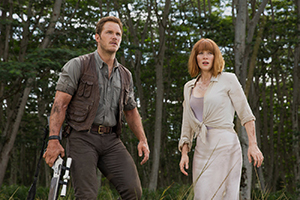 Jurassic World, the latest successor to the 1993 megahit Jurassic Park, includes chatter about gene-splicing and a few other concessions to the moment, but the movie still manages to feel dated and even a bit stale: a mixture of standard shocks, rote plot developments, dinosaurs gone wild and cornball moments that play like bad Steven Spielberg. There’s a possible reason for that: Spielberg, who directed the original, served as an executive producer of this edition and selected its director and co-writer Colin Trevorrow. Mostly unknown to mass audiences, Trevorrow made a much-admired indie, time-travel movie called Safety Not Guaranteed (2012). I wish I could say that Trevorrow hit this one out of the park (Jurassic, that is), but the best I can muster is subdued acknowledgement that he’s assembled a movie that many will find satisfactory. Alas, I am not a member of that group. For me, Jurassic World lacks the bite and the fright of the original. It is neither ironic, nor completely sincere and its attempts at tongue in cheek humor feel more or less blatant. At one point, for example, Trevorrow and his colleagues show a giant sea monster devouring a live white shark that’s been suspended from a hook. Some may see this as a commentary on past blockbusters, but the filmmakers seem little concerned that the primary purpose of this brutal spectacle is to allow the audience to delight in a feeding frenzy. This and lots of other action takes place at a theme park off the coast of Costa Rica. Tourists evidently flock to Jurassic World to enjoy views of dinosaurs in their natural habitat. The disasters of the first movie mostly have faded from memory, and Jurassic World has become a prime family destination. True to show-business fashion, the owner of Jurassic World (Irrfan Khan) has pushed his staff to come up with a new and more frightening dinosaur. Heaven forbid that the ravenous multitudes become bored with the same old predators. The wizards at Jurassic World have responded by genetically engineering a creature called Indominus rex, a massive white beast that’s being kept under wraps. Think it eventually will get loose? A whiff of a story blows through the increasingly rampant action. Two brothers (Nick Robinson and Ty Simpkins) are sent by their parents to visit their aunt Claire (Bryce Dallas Howard). As the super-busy manager of Jurassic World, Claire initially delegates responsibility for her nephews to a less-than-enthusiastic assistant. Of course, things go awry. Indominus breaks loose, people are gobbled up or trampled, and Trevorrow piles on action that’s supposed to quicken the pulse. The actors often are stuck gaping at the special effects, cueing the audience that it’s time to respond with a sense of wonder. A word or two about the movie’s wafer-thin characters. Chris Pratt plays Jurassic World’s raptor trainer and animal advocate. He also provides an obligatory love interest for Claire. Both Pratt and Howard are given an old-fashioned gloss that revolves around faux bickering and lame banter. For her part, Howard’s character spends most of the movie running from danger in high heels. A bow to the unabashed movie glamor of yesteryear? In another failure of imagination, the movie introduces us to Jurassic World’s head of security (Vincent D’Onofrio). This guy harbors conspiratorial ideas about using dangerous dinos for military purposes. Once again the government wants to co-opt science to bolster its own malignant ambitions. In its most daring twist, the movie treats its raptors as tolerant of those who are friendly to them. At times, these raptors stop just short of being cuddly, thus reflecting the dual Spielbergian sense of danger and intimacy. Here’s one way to evaluate the movie: Close your eyes for 10 minutes. Then open them. Jurassic World will look pretty much like it did when you stopped watching. People will be running. Some will be eaten. Others will scream. It’s chaos, I tell you. Chaos. Not much thought seems to have been given to exacting sympathy for those poor souls who become dinosaur food, and the only thing about Jurassic World that made me scream were some obvious, early picture product placements. Too bad the dinosaurs didn’t gobble some of them up, as well.